How long does it take to become a good contemporary dancer? Okay so I have one year to learn contemporary, I feel like I can do it after I am flexible, because I learn quickly. How long does it take to become a good contemporary dancer? Comments for How long does it take to become a good contemporary dancer? For example, if you are an eighteen years old experienced ballet dancer, you might become very good at contemporary dance in two or three years with a very frequent training. If you are an absolute beginner at any type of dance, it may take you eight years of very frequent training (at least four times a week, six times ideally) to become a very good contemporary dancer. However, remember that contemporary dance is not reduced to just acrobatic or physical skills. Contemporary dance is also about intelligent ideas, ethic values, creativity, social and political experience and other issues. So, flexibility, force, coordination, expressivity and other common dancing skills are just one part of what you would need to learn. There's a whole universe of thought and feeling to discover when practicing contemporary dance. That's why I say it may take you eight years at least if you are just starting. Still, professional contemporary dancers usually consider themselves as within a continuous learning process. Contemporary dance is the reflection of the dancers' desires and it evolves together with them. So, there are always new things to learn or discover. I tell you that, just to make you aware of the fact that the learning time is not so important in contemporary dance. More important than that is the PROCESS of learning and the constant experience it offers to you and your life. So, if you want to join in, just do it. Every dancing second counts as a vital experience, just at the moment it happens. Give it a try and you'll see! You are at a very good age to start, so don’t worry about that. If you want to be a dancer of a professional level, it is better that you focus on dance as your main activity. Using a lot of time in many hobbies and other activities may make your learning process slower, indeed. Is my age bad ? I'm a 14 year old girl and love watching people dance and I have always wanted to start contemporary dance lessons but I'm worried as I'm not very flexible and that I'm too old to start I have only taken street dance lessons before so I have no experience with contemporary any tips ? Is is too late for me to succeed professionally in the dance world? Can I start dancing at 16? So I'm 14 turning 15 and I started dancing when I was 11(very late to people I know) and it was with my church company and they had good teachers and by my second year I was in company. But I didn't feel like I was getting more from the classes. Now that I'm in high school and my schools a performing arts school and I see the girls that are in higher levers of dance that are so good and they've danced since they were like 2 but they were just babies so no real dance skills could have came until they were like 10 or so, right? So I'm just asking how long will it take for me to get to a good level? Because these girls are taking master classes at 15 and doing auditions for like New York and stuff. Please scroll up, and read my first reply in this same chat. That's the answer. Yes, it is possible, but everything depends on your own conditions and learning circumstances. If you want to do it, you have to go on and try to see what happens. If you can not practice at home, put a pair of snickers on and go practicing to a park, a public stage, a football field or wherever there’s enough space. A dancer can´t stop practicing. If you really want to be a professional dancer, you should move to a city where you can study in a serious way, at a formal dancing school. If you can not afford that, continue searching in the web and follow the online classes available. Yet, that is not as good as attending an offline school. Hey… the answer to your question is written in the first reply I gave in this same thread. Just scroll up and read what I wrote the 12th July 2012. Hi so I always wanted to do contemporary dancing ever since I was little (we didn't have that much money) now I have chance, but I just turned 14 and I wonder if I'm too late. I'm flexible but the only thing I can't do anymore is the splits (which I'm teaching myself how to do again). Please scroll up and read the first reply I wrote in this chat. The answer for you is explained there. practing singing, and dancing (I've been doing this for almost 2 weeks now) anyway I was wondering if I keep up with what I'm doing every day and work hard enough for what I really want could I be successful learning contemporary ballet? Or did I start to late? And what age would I be well experienced with it? Thank you for taking the time to read this. Please take your time to read the first reply I wrote at the beginning of this chat. That will explain what you want to know. I am 12 years old.I am a little bit fat but tall also.I have too much interest in contemporary dance.All my friends tell if you want to be dancer you need to be thin and flexible.And I am too much worried.And I heard that contemporary dance is too hard to learn. Learning to dance is not difficult, if you follow an adequate process. Please take your time to read my first reply in this chat to understand better. If you want to dance, you should do it. You can only know what you can do if you try it. hi, i'm a 17 year-old and i recently decided to persue dancing as one of my passions. i have absolutely no dancing background except taking contemporary dance on summer over the past 3 years. i'm afraid because my lack of flexibility and time, plus my age, would be a problem if i continue. Do it if you love it. The practice will give you the answers. Everything depends on your goals and dedication. I have wanted to learn how to dance for most of my life, but am only just beginning now at 22. I do not have any background experience in dance and am currently (and will continue to be) a powerlifter. I’ve always been told I have a "dancer’s body" naturally (5 ft, 125 pbs) but lack a lot of the mobility dance seems to require. Are there any tips or resources you have for beginning and improving in contemporary? Thanks! My main tip is that you practice daily (six days a week). Other than that, I recommend you to be curious and do research frequently. Inform yourself about the current events in the world and about everything that is related to your practice (techniques, aesthetic trends, choreographic methods, etc.). You can start by reading all the articles in this website. They will give you a first glance and may help you find your main interest about dance. I trying learn K-pop choreography I dance everyday at least 2 hours, do you think I can be at least average/good in one year and half? That depends on your talent, discipline and other circumstances. But two hours a day is a good rhythm. Don't give up and you'll see for yourself. I am 31 y.o. and I want to engage in dance. My wish is to focus on ballet and contemporary and/or modern. For the time being, I have to think about my finances so I gave myself a year to make a switch in career that would give me more free time to start training/taking classes while still being able to make a living. I am an absolute beginner considering dance (or any sort of movement training besides running, hiking, free climbing, biking, yoga, calisthenics and parkour, but nothing professionally) although I am not a newbie in arts (though my field was music so far). My question is: with consistent work and dedication, do You think it might be possible to enter the world of professional dance and performance even perhaps only on local/national level? I wanted to dance for years but was not able because of life circumstances and I am certain that performing arts is where I want to direct my energy, time and effort. Dance is something I have a strong passion and desire for and would like to begin with and see where it takes me. Can a free style dancer be contemporary dancer over time ? I'm 18 and I've been a free style dancer since the 7th grade. But recently after quit a hip hop dance club, I wanted to explore and experience new dance forms. And contemporary dance has always caught my attention, but I'm worried since I've been doing hip hop for so long. It'll take me some time to be flexible and coordinated with a contemporary dance. Is it possible for me to still be able to learn this dance form even after 6 years of free style hip hop ? I started to take contemporary classes at 35. I somewhat have sports background and I have been practicing yoga regularly, but this seems much harder. Join in and write your own page! It's easy to do. How? 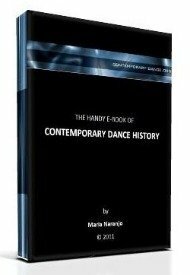 Simply click here to return to Dance Questions from Beginners.